Loox enables merchants to integrate their reviews into Google Shopping using an XML Product Reviews Feed, to display ratings on Product Listing Ads. Please read this article carefully and follow the instructions in order to sync your reviews data to Google Shopping. We will include all of your approved reviews in the XML feed. If you only approve 4 or 5 star reviews and hide lower rating reviews, Google may reject the feed. We recommend approving all reviews and adding public replies to address any negative feedback. Read Google’s full policy here. Note that Google will manually review your submission and can reject the integration at their sole discretion. Log into your Google Merchant Center. If you don’t have an account yet, sign up here. Apply for the product reviews feed integration by filling in Google’s Product Ratings Interest Form. Under "If you use a third-party service, which service do you use? ", answer “Other” and specify “Loox” in the provided text box. You will receive an email from Google saying that “Your aggregator, 'Loox', does not have an approved partnership for the Product Ratings program with Google yet [...] so in the meantime, "<Your Store>" can send a direct product ratings feed to Google”. 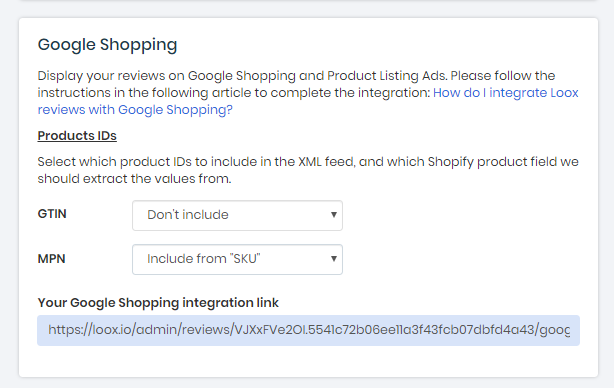 This means that while Loox is in the process of becoming an “approved product ratings partner”, you can still integrate your reviews into Google Shopping using the XML feed. Reply to this email and tell Google that you will submit a direct product ratings feed to your Merchant Center. Important: If you use global product identifiers such as GTIN or MPN, please specify in which Shopify Product field we should read them from. Note: These identifiers enable Google to match reviews to the correct products from the Products Feed you sync to Google. If you only use SKUs as identifiers, no worries - we will automatically include them in your XML feed. Learn more about product identifiers here. Finally, copy your Google Shopping integration link. Once Google approved your application to integrate product ratings, you will see a “Product Reviews” link on your Merchant Center menu. Paste your Google Shopping integration link as the location of your file. Please contact us if you have any questions or run into any difficulties!